As a parent of a baby girl, you will be concerned about her overall development, the most noticeable among them is if her height and weight are in the optimal range and if she is achieving major milestones every month. 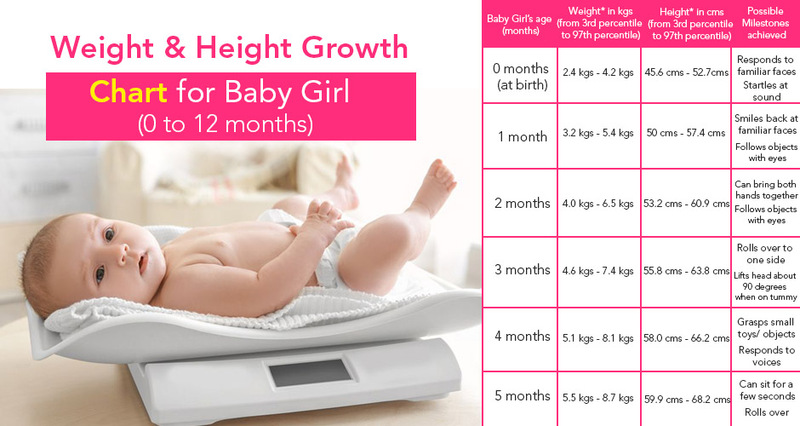 The weight and height growth chart for a baby girl below indicates the range of height and weight at different months. It is derived from the data made accessible by the World Health Organisation (WHO). WHO compiles the percentile growth of babies by taking into consideration the weight and height parameters of thousands of babies. To assess the growth of your baby, your doctor will compare the growth of your baby girl with the standard WHO growth chart for baby girls. 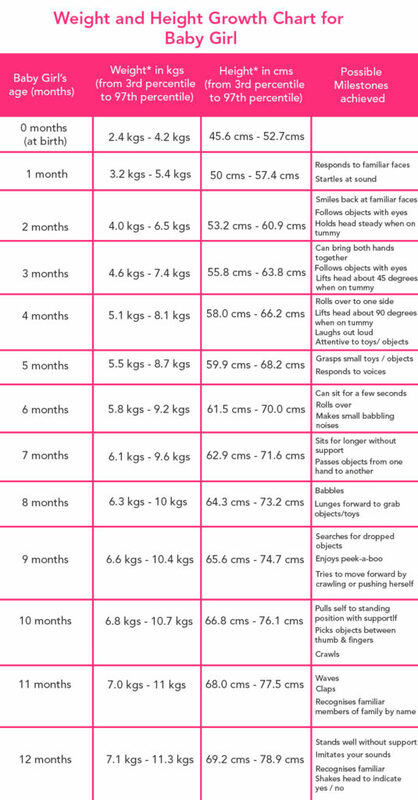 This height and weight chart for a baby girl are from the 3rd to 97th percentile i.e 94% of babies fall in this weight range. 3rd percentile means 3% of babies fall below this range, 97th percentile means 97% of babies fall below this weight range. The height and weight potential of any child depend on many factors including genetics and nutrition. Higher does not necessarily mean better. The growth charts for Baby Boys and Baby Girls are different and one should not be compared with the other. The height and weight of a child in the following months are linked to her height and weight at birth. Meaning, if your child is in the 3rd percentile of weight at birth, she is highly unlikely to go to the 97th percentile in the following months. Children between the 3rd and 97th percentile of height and weight are considered to be growing normally. There is cause for concern if your child falls below the 3rd percentile or above the 97th percentile, in which case you must consult your child paediatrician.